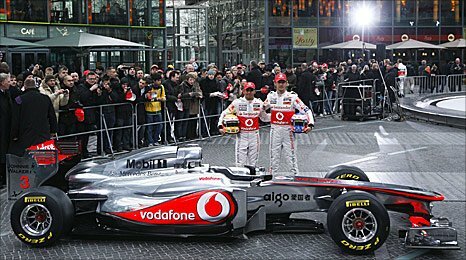 McLaren launched their new car for 2011 in Berlin today. At first, it was hard to notice any real differences between this car and the 2010 challenger. However, upon closer inspection, you can see that the car features very distinctive L-shaped sidepods, the likes of which we haven’t seen before. Whether or not they make a great deal of difference aerodynamically remains to be seen, but you certainly can’t fault the McLaren engineers on their ingenuity and originality. I was however very surprised to see essentially the same front wing and nose as the previous model, which was evolved during the last campaign. They haven’t really got aggressive with the design of that part of the car in the same way that Mercedes have for example, which is surprising. The rest of the changes appear to be under the hood, or are just waiting to be added to the car later on during testing or before the Bahrain GP. McLaren have the most experience with KERS of any team as they ran it at if not all the races in 2009, then the vast majority of them. Not only do they have experience with it, which many teams such as Mercedes and champions Red Bull don’t, but they also have what’s widely acknowledged to be the strongest and most reliable KERS unit. That combined with the also very strong and reliable Mercedes engine could put them right at the sharp end of the grid this year. Jenson has said that the Pirelli tyre characteristics should benefit his gentle style which is another bonus for him and the team. I really think McLaren are going to be far stronger this year and give the other front running teams a lot to think about.